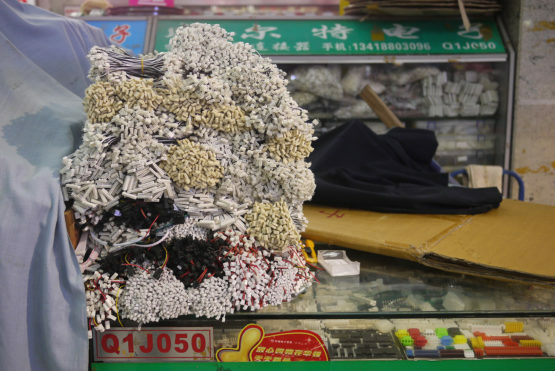 Can China mass produce DIY culture and become a nation of makers? In January 2015, Chinese Premier Li Keqiang dropped in on OCT-Loft in Shenzhen. The sprawling 'creative culture park' in the west of the city has recently been converted from communist-era factories into a trendy complex of exhibition spaces, boutiques and workshops. With media in tow, the premier was here to visit the Chaihuo Makerspace and deliver a rousing message about the country's new agenda for homegrown innovation. It was his first working day of the year so the agenda was pointed. China must become a nation of makers, he announced, waving at the fresh-faced, thick-specs geeks around him. "Makers show the vitality of entrepreneurship and innovation among the people! Such creativity will serve as a lasting engine of China's economic growth in the future." This seemingly banal message is in keeping with decades of Chinese economic policy; but the 'maker' bit is new. Since that moment, the country has sprung into action to follow the directive from on high. 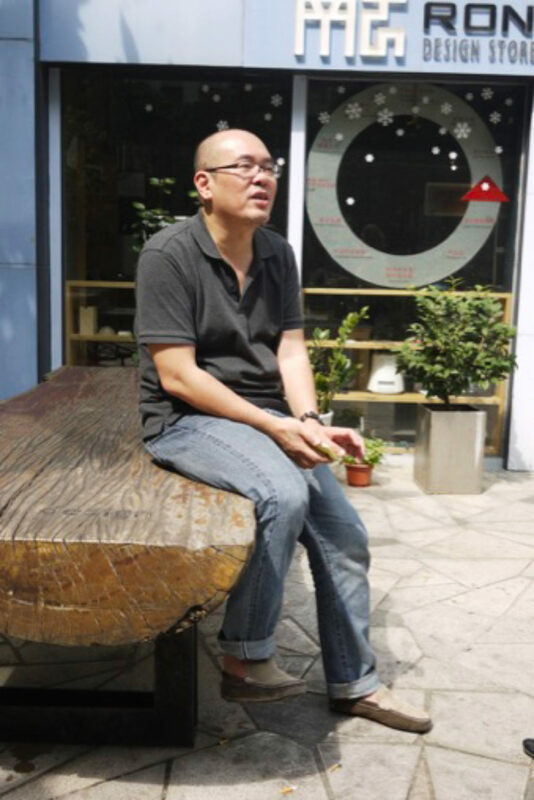 In China the 'maker movement' is flourishing in the popular imagination and zeitgeist. 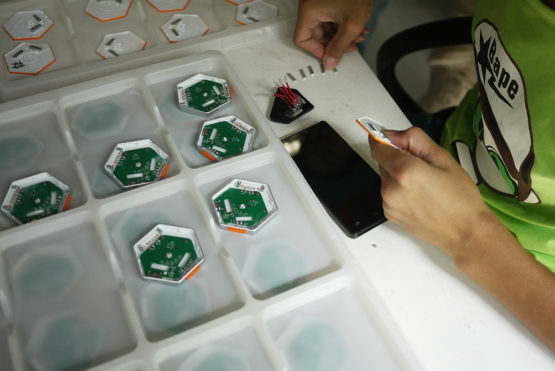 Across China, every other after-school kids' craft club, every technology incubator or creative co-working space, seems to have adopted the name 'maker space' to cash in on the government funding and media attention that followed Li's pronouncement. 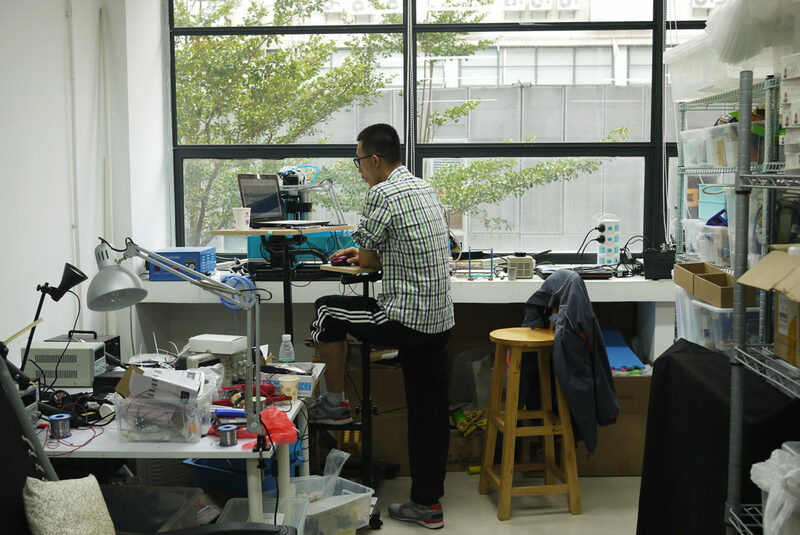 In China the maker movement is generally regarded a bit more seriously than in Europe or America, where it's still largely the preserve of DIY hobbyists; despite occasional grandiose promises that it will ring in a new industrial revolution and upturn the global economy. Owing to the proximity to the heart of global manufacturing, and because craft and production has deep roots in the country, the widely held belief is that idle tinkering here is more likely to lead to serious startups, and mass innovation, of exactly the kind China wants and needs. 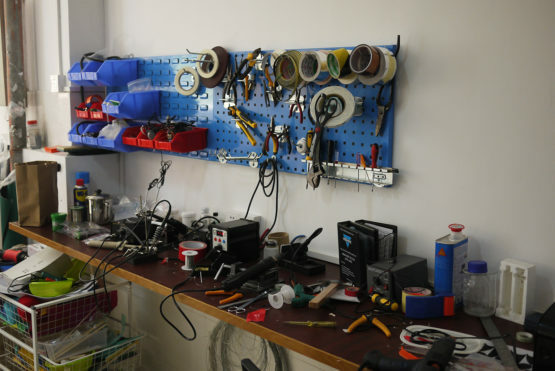 Chaihuo's makerspace, now the exemplary one in China, is similar to those you'd find in the west: a kind of community library for digital-tech enthusiasts. It provides tools people couldn't afford to own outright themselves, like 3D printers and CNC machines that cut wood or metal – and supports a community of like-minded tinkerers who use them. When we visit this auspicious cauldron of future prosperity on a balmy, overcast afternoon in October, the space is empty but for a handful of employees working on their own projects. Two wrestle with a robotic arm, which hangs limply in preparation for the Maker Carnival in Shanghai the following weekend. One of the engineers shows us an empty room with just a photograph of Li Keqiang and Chaihuo founder Eric Pan on the wall. Soon, though, a delegation arrives. Thirty suits file in quickly and loudly, while another employee puts the robot arm down, fires up a projector and launches into a slick, well-rehearsed presentation on the power of making and the movement's singular promise to define China's economic future. Fifteen minutes later the suits have left and the place as devoid of any actual making as it was before. Does this happen often? "All the time," says the engineer. The maker movement, which took off in Germany and the US in the early 2000s, reflects a kind of nostalgia for working with your hands that has been lost in post-industrial economies. But enthusiasts talk about its enormous economic potential. They point to the early internet, and how lowering barriers to entry in the world of making software has allowed 'any kid with a laptop' to start a world-changing business with global reach overnight, owing to the cheap tools and easy distribution of the internet. Until recently, they say, making physical things was a complicated, capital-intensive business. It cost a lot of money to buy production equipment, factories and assembly lines, and even more resources to coordinate a global supply chain, to manage distribution, haul inventory. However good your business idea, making it happen has always been expensive and high-risk: prohibitively so for newcomers. But new technologies, and much cheaper tools, have changed manufacturing a lot over the last ten years. Rapid prototyping equipment like 3D printers allows people to make and revise prototypes quickly and cheaply, and on their own; or to produce smaller runs of goods without the need for a proper manufacturing firm. Advances like Arduino controls and the like allow people to make things with electronic functionality without much coding knowledge. Shared makerspaces bring this stuff within everyone's reach, and community and collaboration both here and online spurs them on. The rise of crowdfunding and alternative finance means that people don't need upfront capital any more to get something made. Once an idea is prototyped and its concept proven, crowdfunding enables its production. People can then sell online to pretty much anywhere. Maker-movement evangelists say that by enabling people to invent their own goods we turn passive consumers into active participants – not just in technological design but the economy as a whole. The economic impact could be greater than that of the internet, with manufacturing becoming more localised, for better or worse. 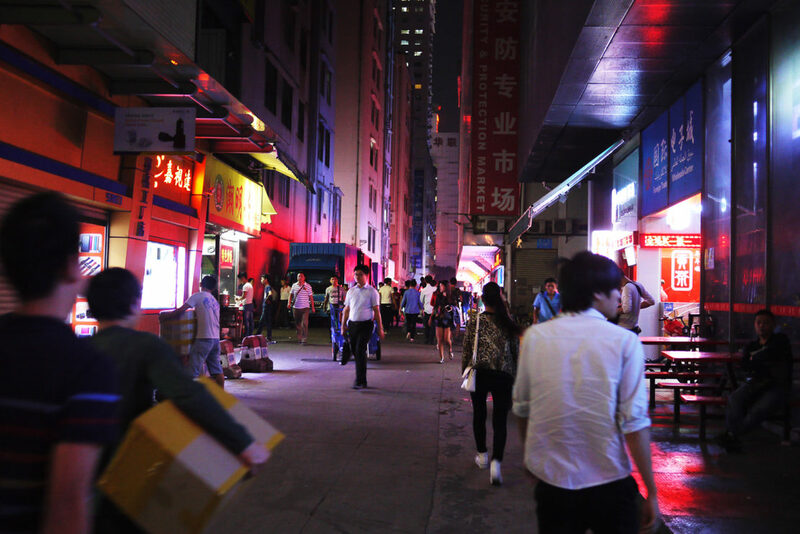 Wander around downtown Shenzhen late at night, beneath the new yet shabby neon-lit towers, and you'll find side streets buzzing with activity. 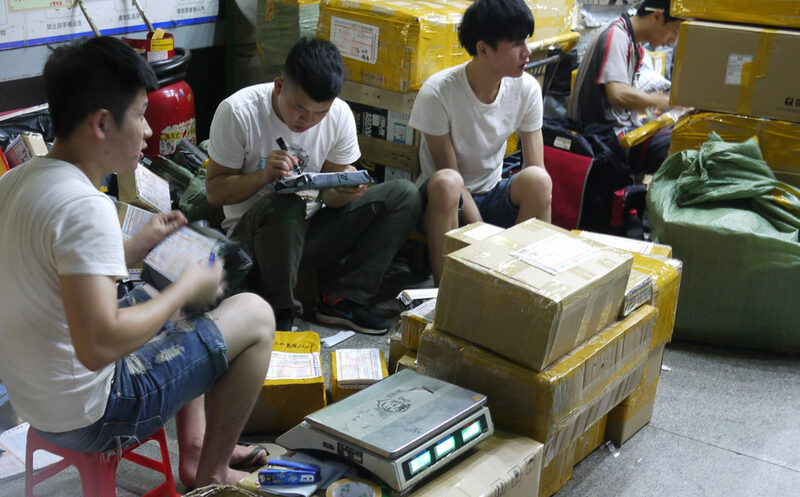 Here among the food vendors closing up shop, the postal workers and fly-by-night hucksters, teenagers are crouched down with hand-tools at ad hoc workbenches – fixing and assembling mobile phones and putting the finished products in packages in the dead of night. They'll be gone by the morning. While almost everywhere else in the developing world this kind of night-time activity revolves around the trade of meat, fruit and veg, here it's phones. "This city is an ecosystem," says David Li, our guide and the founder of one of China's first makerspaces, Xin Che Jian (New Workshop) in Shanghai. "It's not just a huge industrial base." By the side of the street, a couple of guys are stripping binned mobile phones for their component parts like they're shucking corn. As recently as the 1980s, Shenzhen was the cliched sleepy fishing town, a few villages strung together in the south of the country – a place urbanite Hong Kongers just across the border would visit for a taste of rural China. Its transformation into the world's headquarters of making things was radical and deliberate: a vast city grew rapidly through a combination of government policy that opened it up and fitfully encouraged foreign investment. 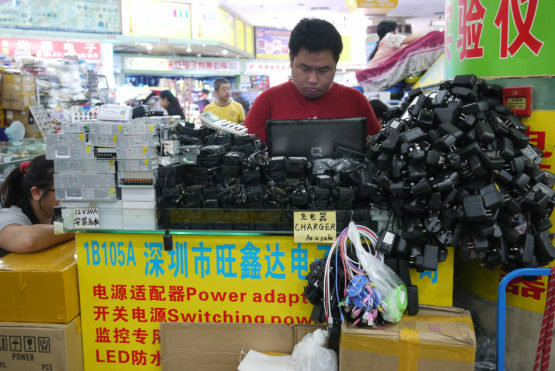 As the west increasingly outsourced, Shenzhen became a vital part of the global supply chain. Today the city's population is somewhere in the region of 20 million. As much as 40 per cent of all the world's goods are made in this one dense region, including the majority of its consumer electronics and practically all of its smartphones. As it has become the factory of the world, a complex, sophisticated manufacturing ecosystem has developed. For global manufacturing, it's got to the point where the resources and expertise for making certain products exists uniquely in Shenzhen and the Pearl River Delta – and can't be replicated anywhere else. For the entrepreneur, it's a completely unparalleled maker's mecca. 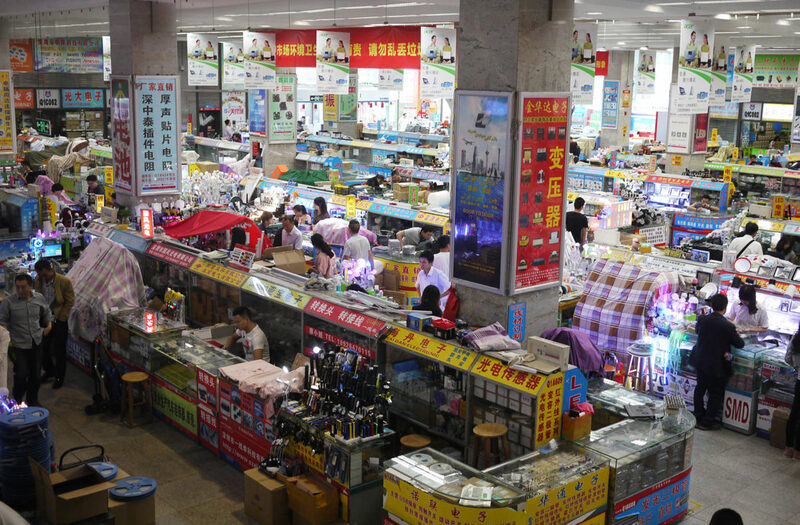 At the electronics markets of Huaqiangbei, a high-rise area in the middle of Shenzhen, multi-floor malls sell a panoply of computing dross, from high-margin, fully assembled computers and the latest trending gadgets – hoverboards and microdrones, on our visit – to disassembled scrap and new parts. The spirit of it is something between a car boot sale and a trade show, with stalls and booths specialising in different scrap components: reels of resistors, bags of PCB boards, iPhone volume buttons by the bucket. Everything to make anything. Elsewhere there are 3D printers, drones of all sizes, and fake Apple watches with bonus features like front-facing cameras or bunny ears for speakers. Real, recycled and counterfeit stuff is unselfconsciously displayed together. There's knockoff everything, much of it you wouldn't think was worth knocking off. A few floors up it's a bit quieter, with stalls that operate mostly as fronts for much larger operations or factories, where you order their wares in the tens of thousands. Visiting these markets gives you immediate access to the resources and expertise of the city. As the big producers built themselves up in Shenzhen in the 1990s, an informal web of manufacturing businesses also emerged and spread out with it, a bottom-up response to the bigger manufacturers that fed off them, catering to no-name clients with smaller runs – the strange, scrappy world of shanzhai. The term is originally and loosely associated with piracy, particularly that of cheap mobile phones. Estimates say it makes up more than 10 per cent of the phone market, and 20 per cent of that of non-smart phones, with huge sales across Asia, Africa and South America. Shanzhai now increasingly refers however to the open manufacturing system that's emerged in Shenzhen. Shanzhai producers make cheap phones not just for poorer markets but also niche, often culturally specific products no big companies bother with. Producers grow by responding to what sells, quickly stepping in to meet new demands. Take the hoverboard – the short-lived Segway-esque self-balancing scooter boards – the quintessential invention borne of this ecosystem. A product with no discernible single inventor, no brands associated with it or even an agreed-upon name that came to dominate global markets overnight (until they started blowing up). Rather than a single inventor or the result of corporate R&D, the hoverboard is a product of a collaborative process in which the design developed in informal networks of manufacturers and online. As soon as it took off, more than 1,000 factories began to produce the same basic product, with little care for who took credit. These businesses move phenomenally quickly, with often almost total disregard for intellectual property rights and little care for branding: it's about making what people will buy, and in the quickest, most efficient way possible. The speed of it is such that designers of products on Kickstarter have found their designs ripped off and for sale on Alibaba even before the campaign's finished. Openness comes from the city itself. 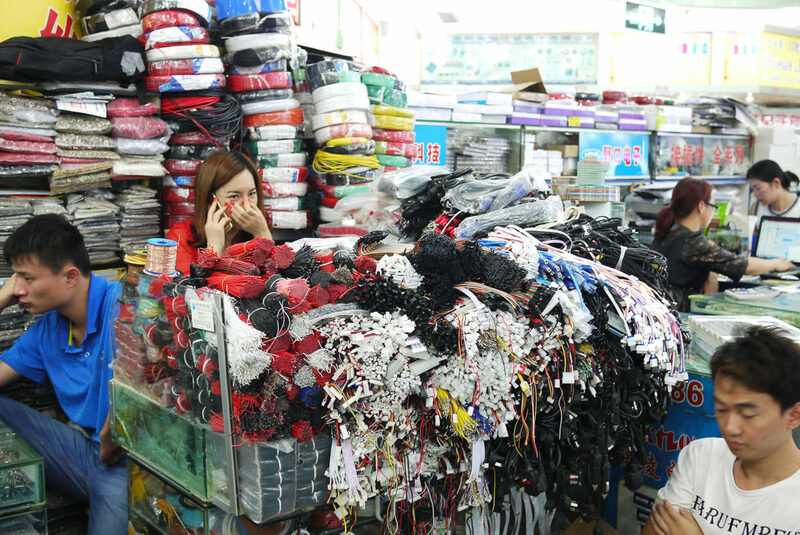 Shenzhen is almost entirely made up of young migrants: no one is from here. A 95 per cent first-generation population creates a particular kind of attitude, different from that found elsewhere in China. There are no old families, there's little old money and few of the traditions or rules that bog down personal or business interaction in Beijing or Shanghai. This brings together people who don't normally necessarily relate to each other in a way that doesn't happen in the older cities. Meanwhile the city itself, as a special economic zone, has been deliberately created as a freewheeling money-making engine with few formal rules of its own and many international links. 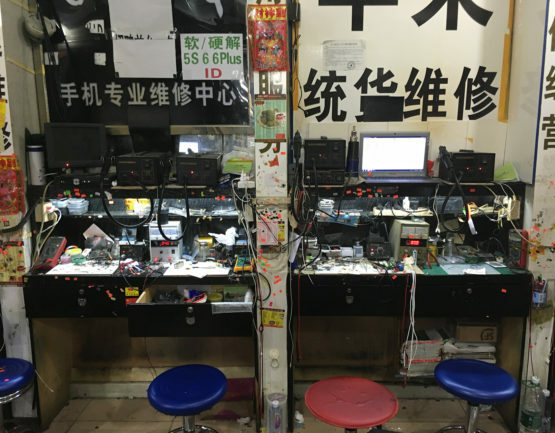 Shenzhen's latest migrants are wealthier, middle-class makers, hackers, entrepreneurs and artists. For startups here then, the steps from prototype to product are dramatically reduced. What takes months anywhere else takes days or hours here. The component you need can be found at the market around the corner, or more likely ordered to your exact specification as soon as you want it. Build your prototype, head to the assembly line to push out 10,000 of them, put them out to market, see what sells. Makers can develop and ship products as quickly as they do ideas. While some of Shenzhen's lower-end manufacturing moves elsewhere, higher-tech products and expertise remain. Big manufacturers are adopting similar agile processes to those of smaller-time makers, making it much easier for anyone to access industrial manufacturing. For the Chinese government, promoting making is about encouraging creativity and risk-taking in a country characterised by rote learning and safe bets. The aim is to get the growing graduate class to tinker. It is only recently that a middle class has emerged in China with time for hobbies and the financial security to take risks. With effectively no social safety net, failure can land especially hard. Young entrepreneur Eric Pan, founder of Chaihuo, has come to represent all the business promise of the Chinese maker movement, held up by Premier Li and the government as the archetypal maker success story. Pan came from a small city outside Shenzhen and, although he didn't go to a top college, he studied electronic engineering and got a top-flight job at Intel in Chengdu. After two years, he threw in the towel – against his parents' wishes – and went to Beijing to try his luck at startups. It didn't work out. David Li takes up the story. "Eric rode a bike from Beijing to Shenzhen, checked into a small apartment with a friend, and started Seeed Studio from his living room. And now he's grown it to an internationally respected brand." Pan says, simply, "I got too bored. I wanted to explore what it would be like to go out with nobody telling you where to go, I wanted to try something new." Li says that Pan, with his university education and success as a homegrown entrepreneur, is exactly the kind of example China needs. "Without Eric, there might not be the political will: he is the political poster boy for the whole thing." Because the Communist party doesn't trust the market alone to encourage the type of entrepreneurship it is hoping for, local governments are lavishing resources on young businesses. At a science park on the outskirts of Nanjing, the ground floor of a building provided free by the local government is given over to the Nanjing Makerspace: a government accelerator in building form, with around 30,000 individual makers involved in some way or other. It is also indicative of how larger firms are embracing the maker spirit. Companies like Intel give makers products to experiment with and problems to solve. Even quite conventional companies like white goods giant Haier – neé the Qingdao Refrigerator Co, before reportedly changing its name to sound German and reliable – are drawing on the maker narrative. Foxconn, the firm synonymous with big manufacturing, has a makerspace for its 200,000 workers at Foxconn City. Entrepreneurship is growing rapidly in China, says Zhang MingHui, who oversees Nanjing Maker Space's accelerator programme. It's designed to encourage Nanjing's entrepreneurs to stop copying and build their own things; and to help put a growing graduate class to work when there aren't enough big companies to take them on in traditional roles. We visited a state-owned enterprise that focused on electronics for the military. It had set up a makerspace as part of its R&D, to attract young engineers who might find the straightforward rocket-building stuff too boring; and to allow them to be more creative by finding time to 'play' on unrelated things. Instead of showing us military hardware cooked up on 3D printers, our guide leads us to a toy keyboard designed to teach kids to play the piano, with illuminated keys indicating which ones to press. A high-ranking military man performs a Chinese folk song to me, looking up expectantly. It is a vision not of a handful of large companies dominating industries for themselves, but about tens of thousands of firms on a smaller scale. "Everyone talks about a sharing economy when it's not sharing, it's one company taking everything," says Li. "The vision of makerspaces is of people sharing – sharing knowledge, ideas and ways of working." Often their products are things bigger companies may not regard as economically viable, so there is the additional benefit of bringing items to market that would not otherwise exist. And it's a good living for those who do it, forming what Li likes to call the long tail of hardware. "The long tail will disrupt the mainstream," he says. "That, in the long term, is what the maker movement is all about." When Premier Li Keqiang calls for 'mass entrepreneurship' of this sort, it is straight out of the playbook of economist Edmund Phelps, a Nobel laureate whose theories that innovation comes from grassroots and individual spirit rather than big research labs, and that innovation contributes to personal growth, have influenced Chinese government and Li Keqiang in particular. Phelps argues that the mass innovation that sprung up in the early 1800s in Britain and soon after in America resulted not from scientific advances but from economic dynamism, powered by individualism, vitalism and a keenness to experiment. This would support mass innovation across a whole population, not just in science and tech. Although this kind of 'mass flourishing' would seem at odds with Chinese conventions – Phelps got in trouble once for suggesting that China needed to get over its obsession with safe government jobs and let its young people take risks – the country's booming middle class brings boldness and self-confidence, and there are signs of change. Kids no longer want jobs at Baidu or Intel, they want to start the next one. "What Premier Li has done so far is notable I think," says Phelps. "He's made it easier for firms to start up, and has never stopped urging Chinese people to innovate." The government is betting that quantity begets quality. Premier Li says 12,000 companies were founded per day in 2015. A lot of money is coming in: not just from heavy government spending but also in huge amounts of venture capital (Ersnt & Young counted $49bn in deals made in 2015). The idea is not so much to unearth big disruptive innovations that will compete with western tech giants – although it may want that. The maker movement is about the mass amateurisation and dispersion of what the professional industry has already. Phelps says China is perhaps uniquely placed to succeed in this mission. "This surge toward, this phenomenon of a rise in innovation – however narrow or broad it may be, and long-lasting it may be – comes at a time when the west is on its back, so to speak, and certainly not winning any prizes for innovation. It's China's only shot." 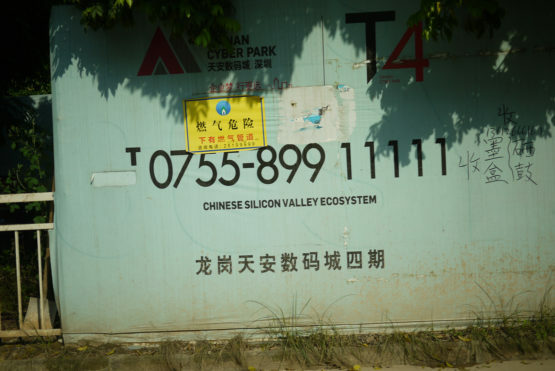 Shenzhen has been called the next Silicon Valley, or the Silicon Valley of hardware. The comparison is apt, but problematic. Like Silicon Valley, everything is in one place, and as that fuelled innovation in Silicon Valley, so it does in Shenzhen. 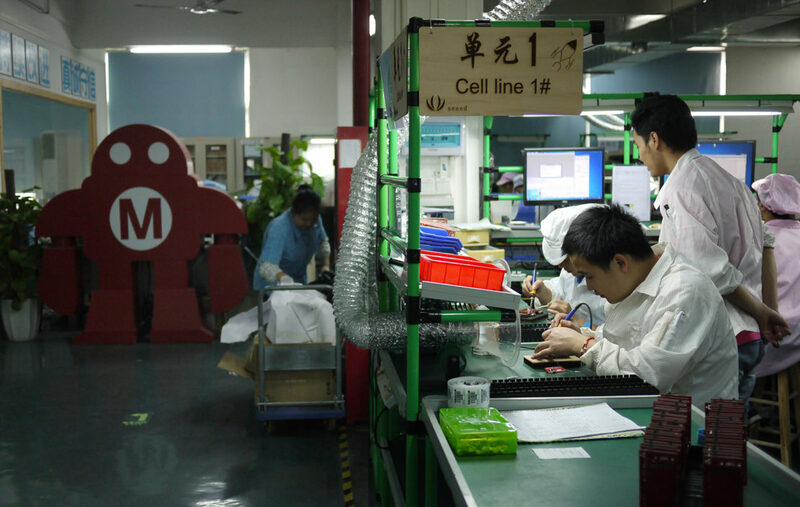 But owing to Shenzhen's unique history and culture of production, innovation means something else here. "China has a historic opportunity," says Phelps. "We've got the global economy now, China is in it, and up to its neck – and the odd thing is that [western] innovation has not just stalled here or there, it seems to have stalled almost universally." Phelps cites phenomenally low growth rates of output across the rest of the world: "China has a fabulous opportunity to jump in." Every generation needs its New Jerusalem. So how and where could we build ours?